We will be exploring 5 popular things you should know about RevPAR and how it may reflect your hotel productivity and profitability. 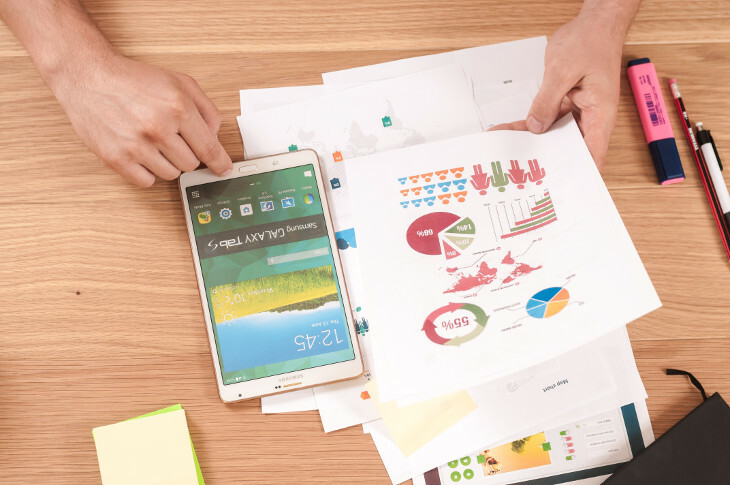 Knowing the factors that tell you something about your hotel productivity will help take your revenue management strategy to the next level. Understanding why hotel managers focus on operational metrics such as RevPAR and how they respond to its periodical growth is a critical component in effectively improving your hotel profitability. What does RevPAR stand for? Revenue per available room (RevPAR) is a widely used performance measurement in the hospitality industry to help evaluate a hotel’s financial results and make investment decisions. Computing a hotel RevPAR is a productivity giveaway for any hotel manager as it gives a precise idea of how much a hotel can charge for its rooms. Now that you know what the ratio stands for, how do you calculate RevPAR? As an example, assume you run a 500 bedroom hotel, with an average daily rate of $100. If your average occupancy rate is 70%, the total revenue generated during one trimester is $3,150,000.00. Therefore, if you made $3,150,000.00 in sales and had 45,000 rooms available during the last 90 days, your RevPAR is $70. This means that every bedroom of your hotel contributes on average $70 in revenue every day. One of the top benefits of recording your RevPAR is to help your hotel be more productive. ”…The ratio of a firm’s outputs to its inputs. It measures the efficiency with which a firm’s managers employ it resources. The higher the ratio, the more efficient the firm”. Besides making your hotel more productive, the key benefit of recording RevPAR is to enhance your profitability. Chekitan Dev, researcher at Hotel School, Cornell University, explains that improving your hotel productivity in downturn periods is vital because it helps your hotel remain profitable. Having a clear productivity focus is also useful when times are good as this helps build a more prosperous brand. Brown and Dev believe that the Room Revenue Per Available Room metric remains the most widely used measure of a hotel’s operating performance. As RevPAR blends together two fundamental hotel outputs, the occupancy rate and the average daily rate (ADR), it is a relevant operating performance ratio for any hotel. Hotel managers need to think about how well they can fill their rooms while being able to charge an acceptable rate for their business. Many hotel managers use RevPAR as a way to drive attention to their rates and make sure they don’t charge too little for their rooms. Imagine you are running a 250 room hotel. You decide to charge $200 ADR per night, with 200 rooms booked on any given night. This means your occupancy rate reaches 80% and your RevPAR is $160, with a total revenue of $40,000. Now imagine that you increase the average daily rate to $300 and that your bookings consequently drop to 150. Your occupancy rate is now only 60%, but your RevPAR has grown to $180. Your total revenue has increased and is now $45,000. With such strategy, a small ADR boost has the potential to lead to significantly better RevPAR and even revenue. But building a more efficient revenue management strategy isn’t just about boosting RevPAR. Because you’re either improving your occupancy rate (while keeping ADR constant) or increasing your average daily rate (with a similar occupancy rate) or both at the same time, it’s likely that your revenue and profitability will improve. That’s why you should always verify how your RevPAR is performing over time before making any changes to your rates. The previous experience helped us understand that it is totally possible get a higher revenue stream from your room inventory while picking up less customers. This will also save you time and money, as you don’t have to clean 50 additional rooms! By testing out different prices and occupancy strategies, you are able to find out what type of balance performs best for your hotel. Preparing a RevPAR strategy sounds easy enough now, right? Focus on improving your occupancy rate and increasing your ADR and there you have it. Except…as revenue managers, we know how that story can end. Deciding on how to prioritize these 2 revenue drivers and when to do so can prove to be difficult. A study conducted by John W.O’Neil and Anna S. Mattila from Pennsylvania State University, focused on identifying which of these 2 ratios has the most impact on a hotel’s net operating income. 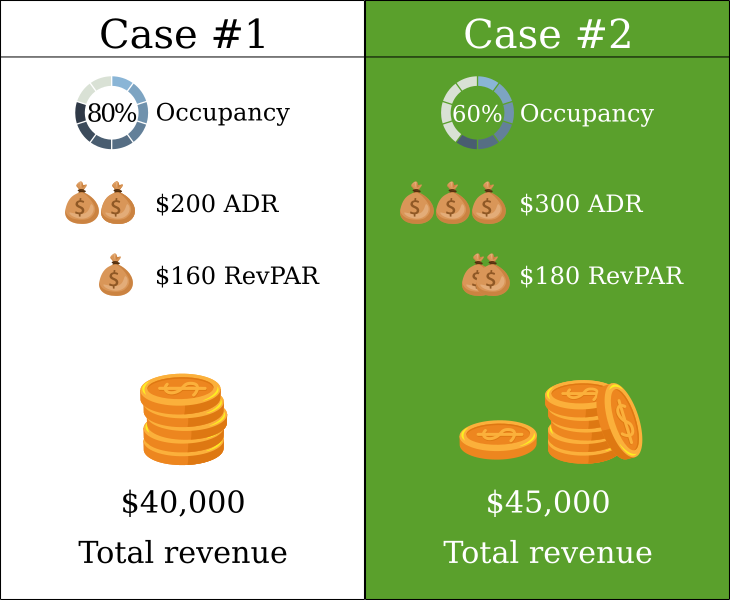 Surprisingly, they found that a revenue management strategy prioritizing occupancy over ADR allows hotels to achieve an overall better net operating income percentage. The important thing to note here is that they were able to demonstrate the existence of an even higher correlation between increased occupancy rate and profitability during periods of economic recessions. While keeping high ADR projections is still a completely valid goal in downturn periods, if you can’t fill your rooms because customers are becoming more price sensitive, it’ll be tough to achieve profitability. Off-peak periods are somewhat comparable to economic recessions as you are dealing with a bigger stock of available rooms and with a noticeable room-rate resistance. Your plan should focus on seasonality and how busy your hotel might be in the weeks ahead. Try to separate expected busy periods from off-peak periods and focus on improving your occupancy rate during off-peak periods. See one of our earlier articles for tips on how to increase your hotel occupancy rate. During busy periods, you can increase your average daily rate. Here, the correlation between occupancy and profitability is less stringent than before as demand increases. Customers are becoming less price sensitive and accept to pay more money for the same room, which will end up enhancing your profitability. Focusing on room pricing decisions that can boost your RevPAR is one of the most important things you should do to increase your profitability. But good revenue managers don’t just focus on increasing RevPAR alone. They are thoughtful about other factors that are equally important to the success of their brand. 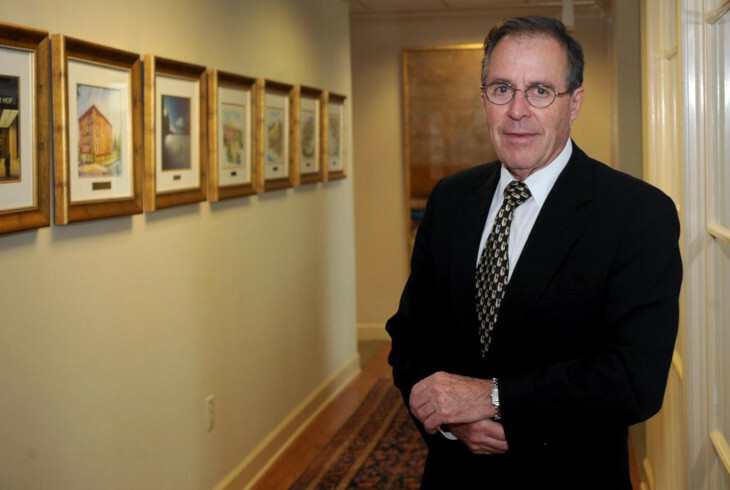 Horst Schulze, former president of the Ritz-Carlton Hotel Company, perfectly summarizes the biases associated with an over emphasis over RevPAR. By this, he meant that you can’t rely on RevPAR alone to ascertain your profitability, as this key metric does not account for revenue you can generate from food, beverages and any other department you may have. Another major limitation with RevPAR is that it does not take into account the costs incurred in the operations to provide the service you offer. To circumvent RevPAR limitations, you should include other productivity indicators to your equation. Compounding RevPAR with other financial outputs such as your total sales, gross operating profit and your income before fixed charges (Profit) is one of the most important things you can do to increase the effectiveness of your growth strategy. I hope this article helps to convince you that your job as a hotel manager isn’t just to rank #1 for some performance metrics such as RevPAR. Let me know in the comments if and when you realized that achieving higher RevPAR isn’t the true goal of hotel professionals.